This product requires the Adobe Flash Player browser plug-in. We recommend that administrators manage policies for Chrome browsers on Chromebooks and on Windows and Mac computers to ensure that Adobe Flash is enabled for all users. See Flash Player Help for general information about installing this browser plug-in. See Google Chrome Help for more information about using Flash in Chrome. Use the Google Admin console to enforce Chrome policies on enterprise Chromebooks. See Google Chrome Enterprise Help for more specific information about Chrome device management. Click Chrome management and select User settings. Navigate to Content > Plug-ins and select Run plug-ins automatically. Enter http://my.reasoningmind.org/* and https://my.reasoningmind.org/* on separate lines under Allow plug-ins on these sites. Click Chrome management and select Public session settings. Public session settings can also be changed in Device management > Chrome management > Device settings > Kiosk settings > Manage public session settings. Log out and then log back in using a public session. Open the Chromebook's Chrome browser. Open the Chrome browser, and go to https://my.reasoningmind.org. Click the click here link to enable Flash. The Reasoning Mind URL is added to the list of allowed URLs; Flash support remains enabled for all Chrome sessions, and doesn't get reset when the browser is closed. However, the setting is reset when the user logs out of the local account or guest session. Add information to the Chrome Property List (.plist) file on a Mac computer to enforce Chrome policies that enable Flash. Go to the /Library/Preferences folder and look for the com.google.Chrome.plist file (create the file if it's not already in the folder). Run the following command to add the Reasoning Mind URLs to the list of allowed URLs for plug-ins. Create a new registry entry to enforce Chrome policies to enable Flash on a Windows computer. 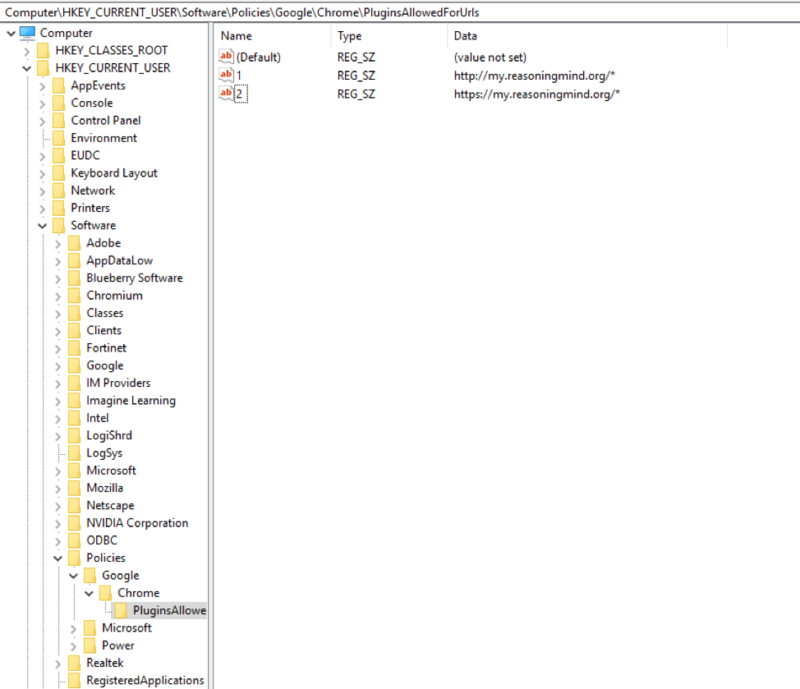 Create a new entry in Computer\HKEY_CURRENT_USER\Software\Policies. If there are multiple users on the same machine who share settings, create the entry in HKEY_LOCAL_MACHINE. Create a key for Google (if not already present) under Policies. Create a key for Chrome (if not already present) under Google. Create a key for PluginsAllowedForUrls (if not already present) under Chrome.